Stream and the main Torii gate of the garden. View from the arbor by the gardenpond, to the pagoda in the back. 1）上原敬二（1983）:この目で見た造園発達史：「この目で見た造園発達史」刊行会,pp221-231. 2）上原敬二（1983）:造園大系第2巻　庭園論：加島書店, pp. 12-20. 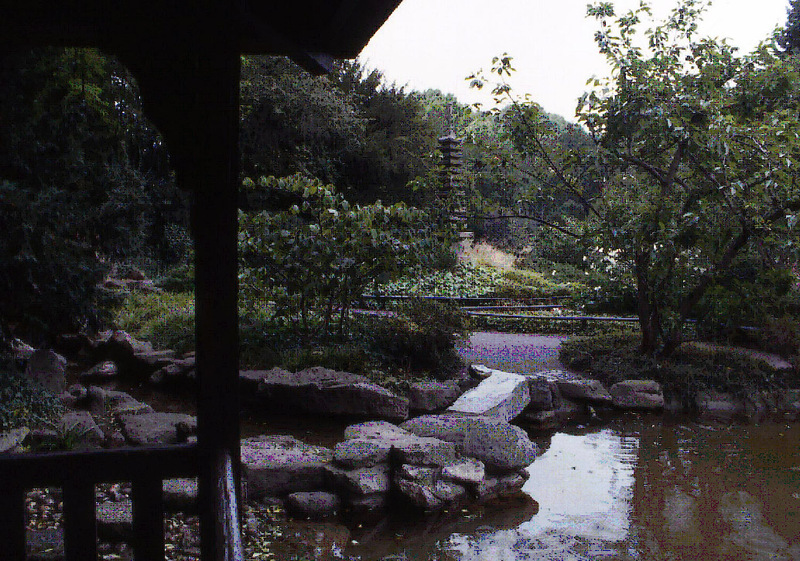 This garden was originally constructed by local residents in 1913-1914, making it one of the earliest Japanese gardens in Europe. A Shinto shrine was added in 1927 at the suggestion of a German professor who had taught at Niigata Medical College in 1923. 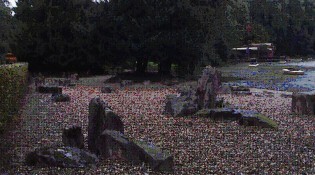 Two stone guardian dogs and a large Torii of Hinoki cypress were brought from Japan at that time. 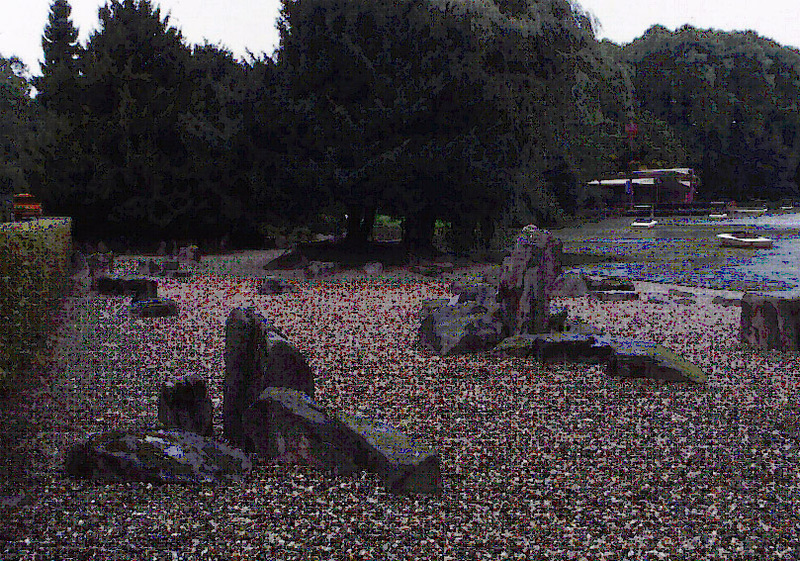 The total area of the original garden site was about 3,300 square meters. Professor Katsunuma Seizo and the City of Nagoya donated a 23-story stone pagoda which was erected in 1938. Though the garden was damaged in World War II, it was rehabilitated and enlarged under the direction of Uehara Keiji in 1967 for the German Garden Exhibition held in Karlsruhe that year. Uehara increased the waterfall flow and repaired the pond. He also created a dry landscape Japanese garden of about 2,640 square meters using local granite; it is said that US forces helped execute the work. 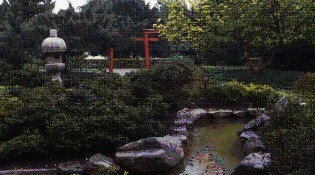 Entrance to the garden is through a red Torii gate, and a path winds along a stream leading to a pond. 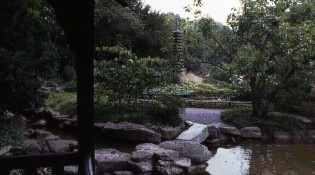 A small pavilion stands next to the waterfall which feeds the pond. 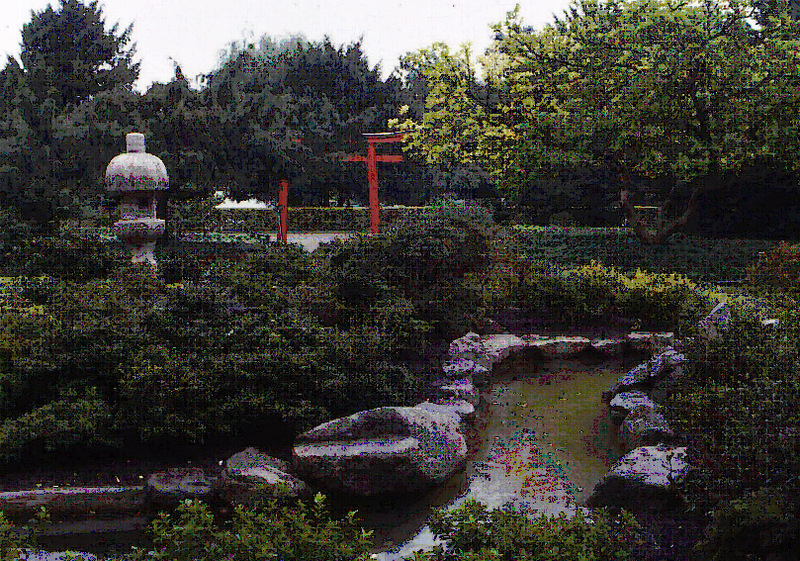 Ownership of the garden was transferred to the German-Japanese Society of Karlsruhe in 1994. Since then, the group has planted several cherry trees and camellias. The garden continues to be maintained by the City of Stadtgarten.